Looks like they finally deleted my account.. I'm not sure when they did it.. it only took them around 5 years. Time to make a new one. Perhaps because my signature "Devastator" was a link to here? That's my amusing thing for the day over and done with.. I'm not entirely sure.. maybe just saw me in the active users list, recognised the name and then took any excuse to remove my account. That's right........................... where are they again? USA? of course their attitude attracted a few of us and some others on facebook to joke around with them and wind them up a bit, t'was fun. 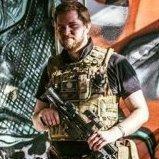 ''Right them,let me start a small airsoft channel with me mate. Now that I've started it, it's mildly successful,I;m a bit of a local icon. Now I'm continuing being regular old me.Casual violence,parkour and alcohol.yay! Now I'm under fire for not being a perfect widdle buttercup and role model and I apparently have to go about always representing airsoft in unrelated things. I hear it's short for "Zero Intelligence", according to Ben Webb of Airsoft International hahaha. I don't think I could agree with him more. Shame there isn't some way it could be short for, "Limitless Ignorance" though, as that would probably be a tad more accurate. Well the sales forums doesn't really represent anything. You can get ripped off on any forum. Just a forum with higher traffic like ZeroIn would more likely have more con artists.